This is not true. It is true that a spring league, called The Spring League and targeted at “players who may have been overlooked by the NFL, CFL and other professional football leagues,” will be starting in 2017. But it has no affiliation with the NFL and will not be limited to “veteran free agent” players. In fact, anyone who wants to pay the $350 application fee and submit a highlight reel can try to earn a spot, according to The Spring League website. SiriusXM NFL Radio is not operated by the NFL and did not give any sourcing for its “news” in its initial series of tweets. Nearly an hour after its original tweet, the station clarified that the NFL would not be affiliated with the new league. 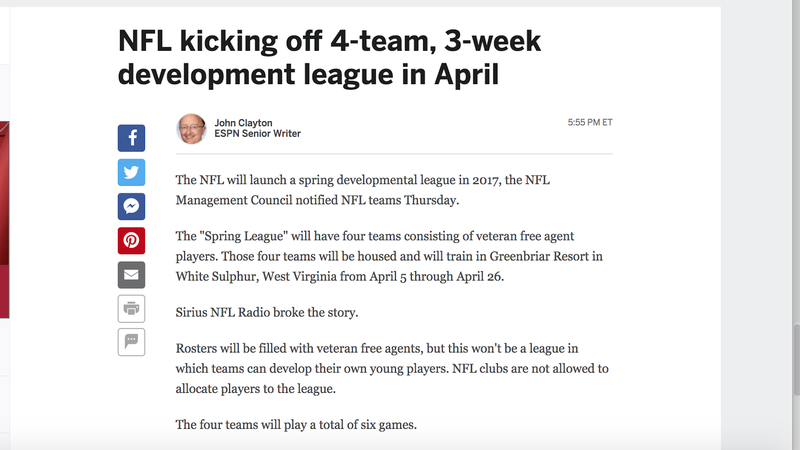 But before they did so, several outlets went ahead and ran pieces on the NFL’s new veteran spring league anyway—including CBS Sports, SB Nation, Bleacher Report, The Sporting News and, most bafflingly, ESPN, under John Clayton’s byline. None of those pieces indicated that their authors had attempted to reach the NFL or NFLPA or any other relevant group for comment. (When our Lindsey Adler did, the league emphatically denied having anything to do with the new outfit, and the union expressed bewilderment.) All have now updated their original posts to reflect the fact that the league is not affiliated with the NFL—that is, to reflect that their original information was completely false. The only one to issue a correction or indicate in some way that their entire post had been changed was The Sporting News.